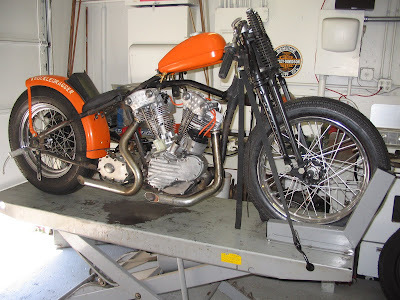 I just thought I would put in a plug for a blog that I was recently introduced to; "Electra Glide in Blue" This is definitely a gearhead blog with some vintage pictures as well a current series on the author's top end rebuild of his '68 Shovel. If you are into vintage iron, give it a click, its worth a look! "The KnuckleDragger" is finally nearing completion! In other words, this is the polar opposite of my racing career 24 years ago. One can hardly go an hour listening to the radio without hearing some form of the "you deserve it" commercial. I think it may have all started out with the fairly innocent sounding "You deserve a break today" jingle from McDonald's. I get the sentiment. You work hard all the time. Take a little break and treat yourself. You've earned it. That jingle was obviously a big success, and so of course many other businesses want to jump on the band wagon. Perhaps the one that irks me the most is the one by a company that promises to help you to get away with not paying your debts. "The credit card companies have all gotten their bailout," it claims "so now its your turn ....you deserve it! We'll help you settle your debt for a fraction of the amount." You deserve it? Let's see, you act like a politician spending money you don't have for instant gratification, and now you somehow deserve to not have to pay it back? "But I do work hard, so whats so wrong with treating myself to that ________ (fill in the blank; new big screen TV, new computer, new designer clothes, night on the town, etc.)" Well, if you spend more than you make, that's what's wrong. And do you really work that hard ....really? As our pastor takes us through the book of Acts in our Sunday morning services, he has repeatedly brought out the point that the current "Health and Wealth Gospel" being preached in some quarters is patently un-Biblical. All of the trials Paul went through are just one of his examples. 1 Corinthians 11:23-27 tells of how Paul was beaten, imprisoned, stoned, shipwrecked, weary, in pain, hungry, and thirsty(partial list). Paul was a choice servant of the most high God! He went though all of this and was likely martyred for the faith. But the "name it and claim it" preachers would have you believe that you will be blessed with untold riches because of your faith! And after all, don't you deserve it? Lest you think that it was only the apostles who suffered, in 1 Thessalonians 1:4-5, Paul commends the church there for their patience and faith through the tribulation and persecution that they were enduring. Yet here in 21st century America, we are being told that we deserve a break today; we deserve to not pay our debts. If you are a Christian and you buy into that, then shame on you. If you are not a Christian and you buy into it, then sorry, but you are mistaken. The Bible tells us that the wages of sin is death. That is what we deserve! Anything beyond that is by the grace of God. The same verse that tells us that the wages of sin is death (Romans 6:23) goes on to say that the gift of God is eternal life through Jesus Christ our Lord. So the next time you are told (by someone trying to sell you something) that you deserve it, keep in mind what you really deserve. You don't really deserve that Big Mac. You don't really deserve to avoid paying your bills. And most of all, do you don't really deserve eternal life. But faith in the Messiah who died on the cross to pay for your sins will provide you with it none the less.